Ashdene's Poppies collection has been designed exclusively for the Australian War Memorial in memory of those who have fallen during both the Second and First World Wars. 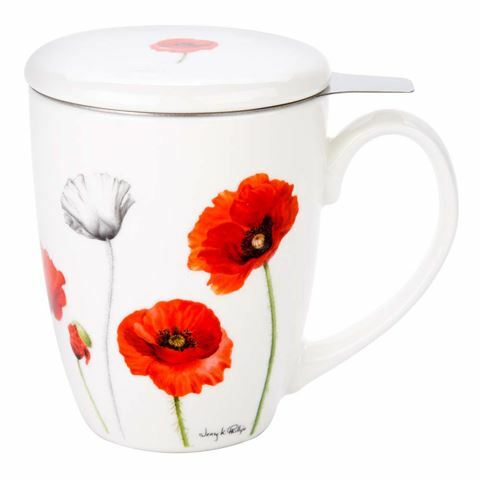 Each piece in this tableware collection features an illustration of the Flanders poppy, which is now an internationally recognised symbol of remembrance, hope and inspiration. Illustrated by leading Australian botanical artist Jenny Phillips, Poppies is poignant and elegant. You'll see the vibrant scarlet blooms of the poppy contrast with sage green stems and black and white illustrations; together, they make for a commemorative gift, or addition to your home. Made from fine bone china, with a stainless steel infuser. Illustrations by leading Australian botanical artist, Jenny Phillips, to commemorate the centenary of WWI and the Anzac legacy. Teacup and lid are microwave and dishwasher safe. Hand wash recommended for the infuser. Presented as a set of three in an Ashdene Poppies gift box.